For training, Piccolo sends Gohan into the wilderness to undergo some incredible changes. Meanwhile, Bulma converts Raditz's power-detector to work in English, and Goku meets the most powerful martial artist in the afterlife. 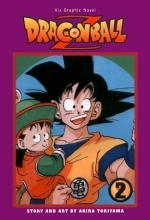 As he trains to be really strong, Goku's friends gather the Dragon Balls again to wish him back to life - just in time, as two Saiyans, Vegeta and Nappa, arrive to destroy the planet!